September’s theme is ‘I started doing this countless years ago‘. We start with radio name 24-san, who’s been doing samba for 18 years. Back then, 24-san was a student, and they started trying it out in a casual, non-committal way because it looked like fun. Now, it’s become an indispensable part of 24-san’s life. 24-san even came 3rd in the Asakusa samba carnival held once a year at the end of August – though they were just happy enough to finish without a single slip-up. When they come back to think about it, 24-san wonders why they’ve been continuing on with samba – While samba uses Brazilian music, 24-san isn’t Brazilian, and hasn’t even been to Brazil. Even if you were to ask 24-san what samba’s really about, they don’t think they’d be able to give an answer. But 24-san isn’t going to quit, because there’s this passionate feeling that 24-san can’t experience with other music, only through samba. One of the items on 24-san’s bucket list is to put that indescribable feeling into words. While 24-san can’t properly explain samba well, they would like to ask Maimi if she can explain what an idol is. To Maimi-chan, what is the definition of an idol? Maimi thanks 24-san, who she remembers having sent in a letter about samba before. She herself isn’t really familiar with samba, and hasn’t really had opportunities to dance it, although she has watched it before. That said, live performances of ‘That’s the Power’ incorporate samba-ish dance moves, and there was a time when they wore flashy clothes and tried out a bit of samba dancing, but they’ve never done full-blown samba dancing before. Samba is something she can’t really explain well either, but in her mind, it’s something that’s amazing and colourful. Coming back to 24-san’s question, Maimi thinks for a bit and comes out with the following: For her, idols are people who deliver smiles. When she was small, she remembers watching Morning Musume。 and thinking that they were truly dazzling. She thinks that the work of an idol is to truly shine, lifting the spirits of those watching them, giving them courage. What a wonderful line of work! She’s recently been trying out the path of Japanese traditions at events, challenging herself to rakugo, recitation, iaido – and it’s thanks to her job as an idol that she receives these sorts of opportunities. She finds it amazing and enjoyable that she’s able to attempt all sorts of things as an idol. Experiencing differing things that excite her is something she enjoys. Being an idol is a fine job, one she doesn’t want to quit. Maimi thanks 24-san for their letter, and hopes that someday, they’d be able to see 24-san samba performances. We start with general letters! This month’s theme is ‘It’s summer!‘ The first letter comes from Dance-san, who also requested the previous song. School starts a week earlier in Hokkaido than it does on the main island, and Dance-san’s younger brothers are getting Dance-san’s help with their homework. Homework reminds Dance-san about their research project in primary school – a papier-mache creation. Following up from that, Dance-san asks Maimi if she still remembers her research projects, and if there were any projects done by her friends that caught her eye. Maimi once made a papier-mache savings box, but she feels like she probably got a lot of assistance with making it, as she’s pretty bad with that sort of hand-crafting. Moving on to projects that caught her eye, one of her friends used ice-cream sticks to make a savings box in the shape of a house. The roof could be opened by a hinge, giving access to the stored money. The girl who did it was really artistic. Maimi takes the opportunity to talk about another project done by the same girl. It’s difficult to explain without seeing it, but it involved using papier-mache bricks held together with a steel frame, and a good use of colours – reds and browns. Maimi enjoys looking at that friend’s artwork. By the time of broadcast, the kids in Hokkaido have probably started schooling. For the Kanto region, school would generally start in September, so Maimi feels that there are likely to be a lot of kids currently rushing to finish their homework. Maimi gives them a friendly reminder to not stay up late, take care of their health, and wishes them good luck. 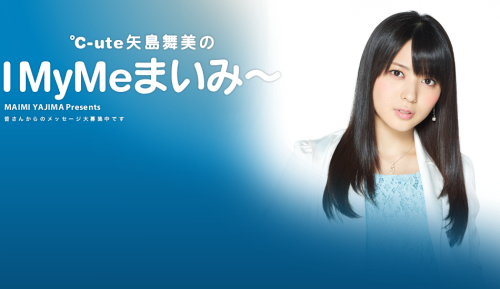 Nacky introduces her guest: °C-ute’s leader, Yajima Maimi! This is Maimi’s first time back on the show since last coming on as a guest back in June, and Nacky says that she already noticed then how reliable Maimi is when it comes to doing radio together since Maimi has her own show, too. Maimi says she still remembers when Nacky started this show and how she had trouble reading aloud the contact information for the show without stumbling over her words. Nacky says she still has trouble with that even now, Maimi says she does, too, and they come to the conclusion that stumbling over one’s words is impossible to fix entirely. They talk briefly about the events they had over the summer. Starting with OTODAMA, Maimi says she had lots of fun firing off water guns and throwing water balloons at the audience. 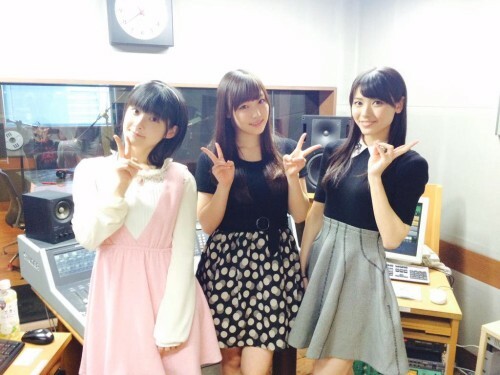 Nacky says their shows at OTODAMA always leave her with a sore throat since she has so much fun performing there. As for Mezamashi Live, °C-ute appeared at the event with the band Akai Kouen. Maimi remarks how cool it was seeing a band play live, and how she hoped some of their fans would also become interested in °C-ute as well. Nacky remembers there being lots of young students at this event. Finally, they appeared at SUMMER STATION, a new event that was held for the first time this summer. Since this event was in the evening, Maimi figured the heat wouldn’t be that much of an issue, but she found herself sopping wet with sweat in no time. Regardless, they were both happy to see that the venue was so packed with people.